Kick off your visit on the 2nd (Fri): delve into the distant past at Hal Saflieni Hypogeum, learn about all things military at Fort Rinella, then contemplate in the serene atmosphere at St. John's Co-Cathedral, then Head underground at Blue Grotto (Il-Hnejja), and finally explore the ancient world of Mnajdra. Here are some ideas for day two: learn about all things military at Fort St Elmo - National War Museum, witness the site of a historic battle at Saluting Battery, and then see some colorful creatures with a scuba or snorkeling tour. To see traveler tips, ratings, and other tourist information, read our Valletta trip builder . Sao Paulo, Brazil to Valletta is an approximately 18.5-hour flight. You can also do a combination of bus and flight. Due to the time zone difference, you'll lose 4 hours traveling from Sao Paulo to Valletta. Traveling from Sao Paulo in August, things will get a bit warmer in Valletta: highs are around 37°C and lows about 27°C. Wrap up your sightseeing on the 3rd (Sat) to allow time to travel to Taormina. Start off your visit on the 4th (Sun): head off the coast to Isola Bella and then see some colorful creatures with a scuba or snorkeling tour. To find ratings, more things to do, other places to visit, and tourist information, refer to the Taormina attractions planner. Getting from Valletta to Taormina by combination of ferry and car takes about 4 hours. Other options: do a combination of flight and train; or do a combination of ferry, bus, and train. In August, daily temperatures in Taormina can reach 37°C, while at night they dip to 28°C. Finish up your sightseeing early on the 4th (Sun) so you can travel to Maiori. Maiori is a town and comune on the Amalfi coast in the province of Salerno . Visiting Spiaggia di castiglione and Lido Capo di Conca will get you outdoors. Satisfy your inner culture vulture at Le Vigne di Raito and Museo della Carta. Step out of Maiori to go to Positano and see Fornillo, which is approximately 1h 05 min away. There's lots more to do: kick back and relax at Lido di Ravello, hike along Sentiero dei Limoni, and take in the spiritual surroundings of Duomo di Ravello. To find more things to do, maps, other places to visit, and other tourist information, go to the Maiori trip planner . The Route module can help you plan travel from Taormina to Maiori. In August, plan for daily highs up to 34°C, and evening lows to 28°C. Finish your sightseeing early on the 7th (Wed) to allow enough time to travel to Capri. On the 8th (Thu), take in the local highlights with Walking tours. To find photos, other places to visit, ratings, and other tourist information, use the Capri online tour itinerary planner . Getting from Maiori to Capri by car takes about 3.5 hours. In August in Capri, expect temperatures between 36°C during the day and 26°C at night. Wrap up your sightseeing on the 8th (Thu) early enough to travel to Fira. 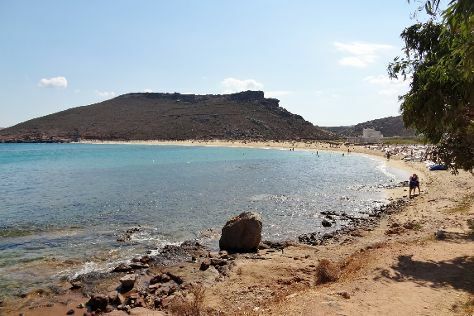 Start off your visit on the 9th (Fri): tour the pleasant surroundings at Red Beach, then explore the ancient world of Akrotiri, and then enjoy the sand and surf at KAMARA BEACH. 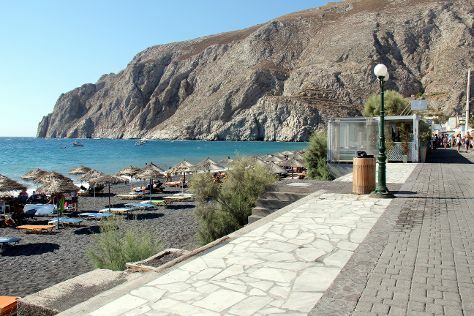 On the 10th (Sat), you'll have a packed day of sightseeing: tour the pleasant surroundings at Caldera Beach, enjoy the sand and surf at Perissa Black Sand Beach, then learn about winemaking at Artemis Karamolegos Winery, and finally look for gifts at the White, Santorini. To see photos, reviews, where to stay, and tourist information, use the Fira trip itinerary site . You can do a combination of ferry and flight from Capri to Fira in 7 hours. Alternatively, you can do a combination of ferry and car. You'll lose 1 hour traveling from Capri to Fira due to the time zone difference. In August, plan for daily highs up to 36°C, and evening lows to 28°C. Wrap up your sightseeing on the 10th (Sat) early enough to ride a ferry to Mykonos Town. Kick off your visit on the 11th (Sun): take a stroll through Little Venice and then tour the pleasant surroundings at Panormos Beach. Get ready for a full day of sightseeing on the 12th (Mon): stroll through Elia Beach, then enjoy the sand and surf at Kalo Livadi Beach, and then kick back and relax at Paradise Beach. To see photos, maps, and other tourist information, read Mykonos Town travel route planner. Traveling by ferry from Fira to Mykonos Town takes 2.5 hours. Alternatively, you can fly. August in Mykonos Town sees daily highs of 33°C and lows of 27°C at night. Finish up your sightseeing early on the 12th (Mon) so you can travel to Athens. Get some cultural insight at National Archaeological Museum and Plaka. 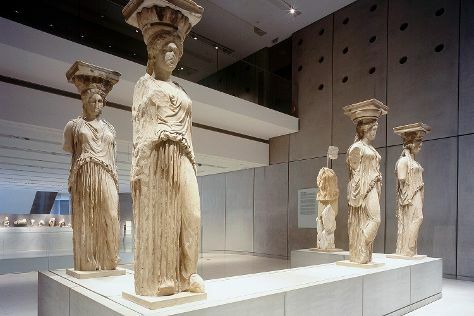 Let the collections at Acropolis Museum and Byzantine & Christian Museum capture your imagination. The adventure continues: explore the ancient world of Acropolis of Athens, appreciate the history behind Temple of Olympian Zeus, admire the masterpieces at Benaki Museum, and examine the collection at The Jewish Museum of Greece. Traveling by combination of flight and subway from Mykonos Town to Athens takes 2.5 hours. Alternatively, you can ride a ferry; or do a combination of ferry, taxi, and flight. Traveling from Mykonos Town in August, you will find days in Athens are somewhat warmer (39°C), and nights are about the same (29°C). Wrap up your sightseeing on the 15th (Thu) early enough to travel to Corfu Town. Kick off your visit on the 16th (Fri): examine the collection at Casa Parlante, then enjoy the sand and surf at Yali Beach, and then kick back and relax at St. Spyridon First Beach. On the next day, explore the ancient world of Old Fortress Corfu, then wander the streets of Corfu Old Town, and then explore the galleries of Corfu Museum of Asian Art. For photos, ratings, and other tourist information, use the Corfu Town online holiday planner . Traveling by combination of subway and flight from Athens to Corfu Town takes 3 hours. Alternatively, you can do a combination of car and ferry; or take a bus. Traveling from Athens in August, expect little chillier with lows of 25°C in Corfu Town. Wrap up your sightseeing on the 17th (Sat) early enough to travel to Rome. Do some cultural sightseeing at Vatican Museums and St. Peter's Basilica. Galleria Borghese and Sistine Chapel will appeal to museum buffs. There's much more to do: explore the ancient world of Colosseum, explore the world behind art at Musei Capitolini, get to know the fascinating history of Piazza Navona, and pause for some serene contemplation at Santa Maria in Trastevere. For ratings, more things to do, maps, and other tourist information, read Rome tour itinerary site . Traveling by flight from Corfu Town to Rome takes 2.5 hours. Alternatively, you can do a combination of flight and train; or do a combination of ferry, bus, and train. The time zone changes from Eastern European Time to Central European Time, which is usually a -1 hour difference. In August, daytime highs in Rome are 38°C, while nighttime lows are 24°C. On the 21st (Wed), wrap the sightseeing up by early afternoon so you can travel back home.